Clear Channel Airports, a brand division of Clear Channel Outdoor Americas (NYSE: CCO), and a subsidiary of iHeartMedia Inc., has announced that the Metropolitan Nashville Airport Authority (MNAA) has awarded it a 10-year contract extension to provide a comprehensive digital media program for Nashville International Airport (IATA: BNA, ICAO: KBNA, FAA LID: BNA) that will enable advertisers to reach 12 million passengers annually. 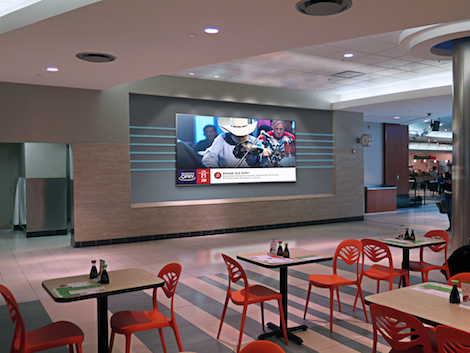 As part of the new agreement, Clear Channel Airports will install an entirely new digital advertising network at BNA that, we are told, will include the world’s most technologically sophisticated state of the art media. Last year, BNA climbed towards the top of the aviation industry’s charts to become the fourth fastest growing airport in the U.S. BNA served 12.2 million passengers in fiscal year 2016, the most in its 78-year history and a 9.8% increase over the previous fiscal year. As home to healthcare industry giants and a blossoming technology sector, the city of Nashville or ‘Music City,’ is one of the fastest growing cities in the country, economically and culturally. The airport averages 440 flights per day and hosts 12 carriers to more than 50 nonstop destinations. BNA regularly adds new destinations and nonstop options for its travelers, most recently introducing service to San Francisco, Oakland and Seattle and last year. A recent Nielsen study showed that nearly 60% of business and leisure travelers believe that advertising in airports is an indicator of high-quality brands and products, and more than three-quarters of leisure and business travelers say they notice airport digital ads, with over one-third of travelers surveyed confirming they’ve visited a website or used an app to find out more about a product or service they saw advertised inside an airport. This entry was posted on Monday, December 5th, 2016 at 08:01 @375 and is filed under DailyDOOH Update. You can follow any responses to this entry through the RSS 2.0 feed. You can leave a response, or trackback from your own site.